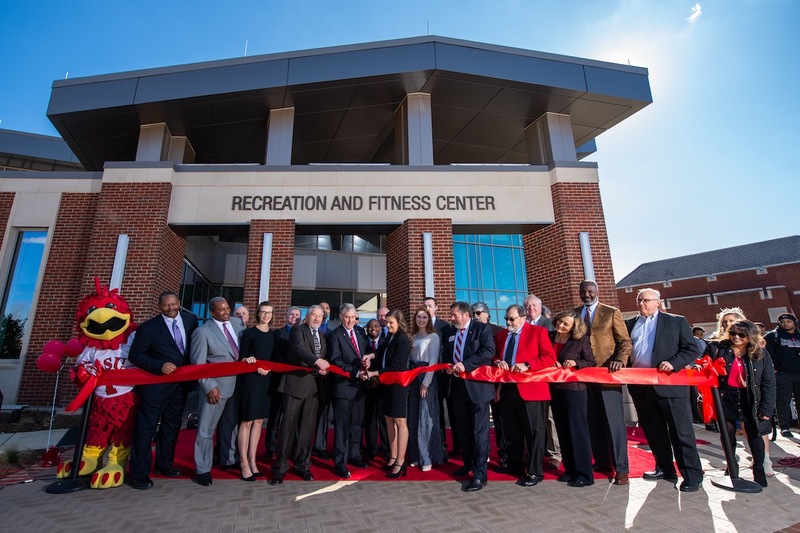 Jacksonville State dedicated its state-of-the-art Recreation and Fitness Center on Jan. 28. The new building is a game-changer for the university, both as a recruitment tool for future students and as a hub of campus life for current students. "It will enhance our enrollment, our retention, our graduation rates and the overall health of our students, faculty, staff and alumni," said JSU President John M. Beehler during the ribbon cutting ceremony. "It's indicative of our strategic plan's vision, since it plays a key role in providing a transformational learning environment that facilitates student success and engagement." More than a place to exercise, the center serves as a gathering space for students – featuring an outdoor patio, video game lounge, ping-pong tables, snack bar and study areas. The center also creates approximately 150 student jobs. The project began in 2017 when Brailsford & Dunlavey, Inc., a national program management and development advisory firm, hosted a campus-wide town hall, held focus group interviews and conducted a web-based survey with more than 1,800 respondents – all in an effort to understand what students, faculty and staff wanted in a recreation center. The architectural firm Moody Nolan designed the facility and Turner was in charge of construction. The center was opened on time and on budget, experiencing no delays in the aftermath of the EF-3 tornado that struck campus on March 19, 2018. The building is operated by CENTERS, LLC, a management company that focuses exclusively on campus recreation for colleges and universities. The $32 million facility was funded by a Public-Private Partnership between the JSU Foundation and the university. All currently enrolled students, who pay a $190 Rec Center fee each semester, are members of the center. JSU faculty, staff, retirees, affiliated employees and alumni may purchase memberships.